Book week is one of my kid’s favourite events on the calendar and this year is no different. Miss 10 is trying to work out which character has the best fashion so she can look her best and Master 8 is trying desperately to convince me that his costume needs to have swords involved, not happening! Last year Master 8 went as Darth Vader and we made this really easy costume using his clothes so he was warm and comfortable and didn’t have to wear a flimsy nylon costume on a 2-degree day. If you’ve got a Star Wars fan in your house and are still looking for ideas then maybe this one could be your sanity saver. I measured the chest panel size for Master 8 and cut out a square of black paper to fit. Cut two small rectangles out of green and red paper. Cut out two small rectangles and 2 line rectangles out of white paper. Using the red paper cut out four thin rectangles and one small rectangle. Glue the shapes onto the black piece of paper as you can see on the paper. Let it dry then laminate the chest panel. Using 1000 mile tape, tap the chest panel on and then cut strips of tape to match the image above. 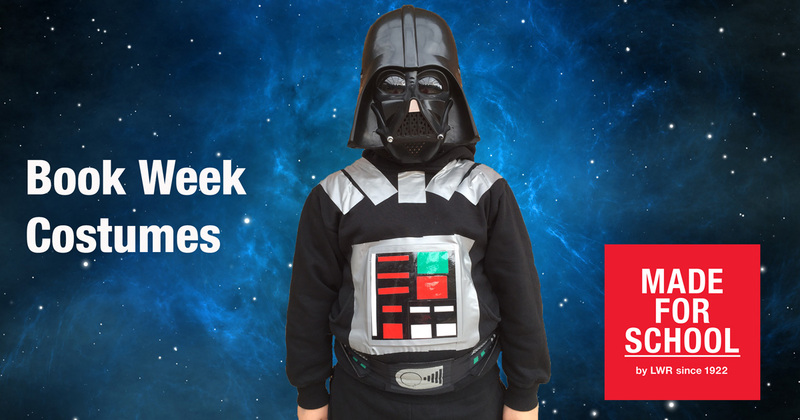 We used a waistband from his Darth Vader costume but you could also make this using the tape and paper. What book characters are your kids dressing up as this year?